During the dark ages, nations like China were relatively advanced while Europeans were living in squalid huts. But that began to change several hundred years ago. Europe experienced the enlightenment and industrial revolution while the empires of Asia languished. What accounts for this dramatic shift? I’m not going to pretend there’s a single explanation, but part of the answer is that Europe benefited from decentralization and jurisdictional competition. More specifically, governments were forced to adopt better policies because labor and capital had significant ability to cross borders in search of less oppression. I’m certainly a big fan of making governments compete with each other, but even I didn’t realize how jurisdictional rivalry gave us modernity. But you don’t have to believe me. This topic was discussed by Professor Roland Vaubel at last week’s Mont Pelerin Society meeting. Here are some excerpts from one of Professor Vaubel’s papers on the topic. …competition among the public institutions of different countries can benefit from an international competitive order which preserves peace and prevents governments from colluding with each other at the expense of third parties, notably their citizens. This post will have lots of additional excerpts, but if you’re not as excited by the issue as I am, just take a moment to review this table from Vaubel’s paper (click it for a larger image). You will see that the intellectual history of this issue is enormous, and the common theme is that big, centralized states hinder development. 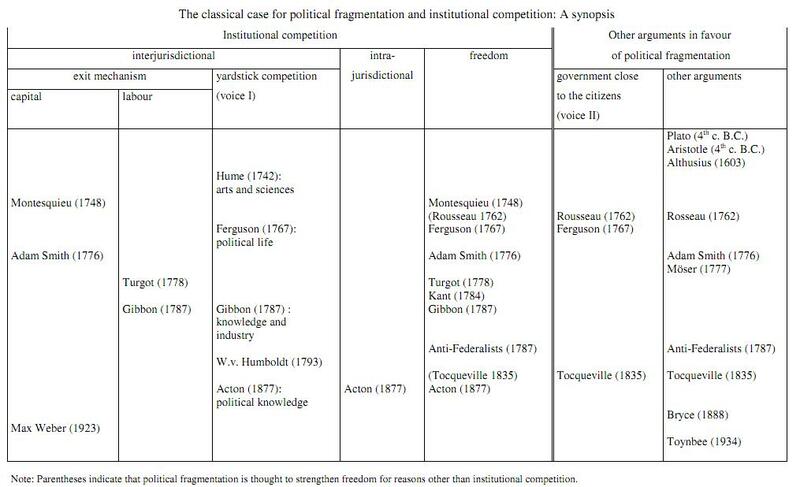 Remember that this table merely looks at the classical thinkers on the issue. The paper also includes modern thinkers, some of who are quoted below. And I also have a postscript that shows how many Nobel Prize-winning economists see jurisdictional competition as a tool for restraining excessive government. But let’s see what insights we can find from the great thinkers of history, starting with this passage from Charles Montesquieu that Vaubel cites in his paper. In Europe, the natural divisions form many medium-sized states in which the government of laws is not incompatible with the maintenance of the state; on the other hand, they are so favourable to this that without laws this state falls into decadence and becomes inferior to all the others. This is what has formed a genius for liberty, which makes it very difficult to subjugate each part and to put it under a foreign force other than by laws and by what is useful to its commerce… princes have had to govern themselves more wisely than they themselves would have thought, for it turned out that great acts of authority were so clumsy that experience itself has made known that only goodness of government brings prosperity. In other words, the mobility of capital among jurisdictions limits government interference. The father of economics, Adam Smith, made a very similar point. Here’s a passage from the Wealth of Nations that Vaubel includes in his paper. The … proprietor of stock is properly a citizen of the world and is not necessarily attached to any particular country. He would be apt to abandon the country in which he is exposed to a vexatious inquisition in order to be assessed a burdensome tax and would remove his stock to some country where he could either carry on his business or enjoy his fortune at ease. A tax that tended to drive away stock from a particular country would so far tend to dry up every source of revenue both to the sovereign and society … The nations, accordingly, who have attempted to tax the revenue arising from stock, instead of any severe inquisition … have been obliged to content themselves with some very loose and, therefore, more or less arbitrary estimation. The abuses which sometimes creep into the local and provincial administration of a local or provincial revenue, however enormous so ever they may appear, are in reality, however, almost always very trifling in comparison with those which commonly take place in the administration and expenditure of the revenue of a great empire. Jacques Turgot (Bastiat was not the only great French economist) looked at the new nation of the United States and saw the benefits of jurisdictional competition. …civil liberty cannot now be easily assailed without inflicting such damage as will be felt in all trades and industries and especially in commerce; and this would entail a diminution of the powers of the state in external relations. This liberty, moreover, gradually advances further. But if the citizen is hindered in seeking his prosperity in any way suitable to himself that is consistent with the liberty of others, the activity of business is checked generally; and thereby the powers of the whole state are again weakened. Kant expanded on this notion in another publication. …peace is created and guaranteed by an equilibrium of forces and a most vigorous rivalry. Thus, nature wisely separates the nations. Lord Acton also noted the dangers of centralization. …the distribution of power among several states is the best check on democracy. By multiplying centres of government and discussion it promotes the diffusion of political knowledge and the maintenance of healthy and independent opinion. It is the protectorate of minorities and the consecration of self-government. …It is bad to be oppressed by a minority but it is worse to be oppressed by a majority. The competitive struggle (among the European nation states) created the largest opportunities for modern western capitalism. The separate states had to compete for mobile capital, which dictated to them the conditions under which it would assist them to power. …how did Europeans escape crippling exploitation by their rulers? … The rulers of the relatively small European states learned that by supplying the services of order and adjudication they could attract and retain the most and best-paying constituents …European kings were never as absolute as they wished. The power dispersed among the great proprietors was a check on them, as was the rising power of the market. Harold Berman of Harvard wrote. In the Western legal tradition diverse jurisdictions and diverse legal systems coexist and compete within the same community. … The pluralism of Western law was a source of legal sophistication and of legal growth. It was also a source of freedom. Brian Tierny noted that rivalry between church and state also helped advance liberty. In the Middle Ages there was never just one hierarchy of government exercising absolute authority but always two – church and state to use the language of a later age – often contending with one another, each limiting the other’s power” (1995, p. 66). “Since, in the conflicts between church and state, each side always sought to limit the power of the other, the situation encouraged theories of resistance to tyranny and constitutional limitations on government. Here are some additional quotes from more modern academics, all taken directly from Professor Vaubel’s paper. “In the West, the absence of an empire removed the crucial bureaucratic block on the development of market forces; merchants persecuted in one place could always go with their capital elsewhere” (John A. Hall 1985, p. 102). “The paradox is that competition between states, economic and political rivalry, and international tension are the best guarantees of continuing progress … The very tension which presents the greatest threat to our survival assures that, if we survive at all, some states, in order to compete better, will be obliged to encourage intellectual freedom and progress” (Daniel Chirot 1986, p. 296). “Competition among the political leaders of the newly emerging nation states … was an important factor in overcoming the inherited distaste of the rural military aristocracy for the new merchant class. Had the merchants been dealing with a political monopoly, they might not have been able to purchase the required freedom of action at a price compatible with the development of trade” (Nathan Rosenberg, L.E. Birdzell 1986, pp. 136ff.). “The political and social consequences of this decentralized, largely unsupervised growth of commerce … and markets were of the greatest significance. In the first place, there was no way in which such economic developments could be fully suppressed … There existed no uniform authority in Europe which could effectively halt this or that commercial development; no central government whose change in priorities could cause the rise and fall of a particular industry; no systematic and universal plundering of businessmen and entrepreneurs by tax gatherers … In Europe there were always some princes and local lords willing to tolerate merchants and their ways even when others plundered and expelled them” (Paul Kennedy 1987, pp. 19f.). “The availability of alternative nation states for production meant that labour expelled from one nation could find other nations in which to locate, and the possibilities opened for capital mobility could operate as a deterrent to widespread political confiscations” (Stanley L. Engerman 1988, p. 14). “Western technological creativity rested on two foundations: a materialistic pragmatism based on the belief that the manipulation of nature in the service of economic welfare was acceptable, indeed, commendable behavior, and the continuous competition between political units for political and economic hegemony” (Joel Mokyr 1990, p. 302). “The various European societies complemented one another, and their internal competition gave (Europe) a dynamism that China lacked” (Mokyr 2003, p. 18). “Ironically, then, Europe’s great good fortune lay in the fall of Rome and the weakness and division that ensued … The Roman dream of unity, authority, and order (the pax Romana) remained, indeed has persisted to the present. After all, one has usually seen fragmentation as a great misfortune, as a recipe for conflict … And yet, … fragmentation was the strongest brake on wilful, oppressive behaviour. Political rivalry and the right of exit made all the difference” ( David S. Landes 1998, pp. 37f.). For those interested in the topic, Vaubel’s entire paper is worth reading. But if you don’t have time, just remember that national sovereignty should be celebrated. Not because national governments are good, but because competition between governments is the best protector of liberty and civilization. I favor tax competition, financial privacy, and fiscal sovereignty because these institutions lead to better tax policy. But Vaubel teaches us that promotion of better tax policy is just the tip of the iceberg. P.S. Since this post is designed to show the intellectual case for jurisdictional rivalry, here are some quotes from a number of Nobel Prize-winning economists. Competition among communities offers not obstacles but opportunities to various communities to choose the type and scale of government functions they wish. …competition among nations tends to produce a race to the top rather than to the bottom by limiting the ability of powerful and voracious groups and politicians in each nation to impose their will at the expense of the interests of the vast majority of their populations. …tax competition among separate units…is an objective to be sought in its own right. Competition among national governments in the public services they provide and in the taxes they impose is every bit as productive as competition among individuals or enterprises in the goods and services they offer for sale and the prices at which they offer them. With apologies to Adam Smith, it’s fair to say that politicians of like mind seldom meet together, even for merriment and diversion, but the conversation ends in a conspiracy against the public, or in some contrivance to raise taxes. This is why international bureaucracies should not be allowed to create tax cartels, which benefit governments at the expense of the people. [I]t’s kind of a shame that there seems to be developing a kind of tendency for Western Europe to envelope Eastern Europe and require of Eastern Europe that they adopt the same economic institutions and regulations and everything. …We want to have some role models… If all these countries to the East are brought in and homogenized with the Western European members then that opportunity will be lost. …while it has always been characteristic of those favouring an increase in governmental powers to support maximum concentration of powers, those mainly concerned with individual liberty have generally advocated decentralisation. [Tax competition] is a very good thing. …Competition in all forms of government policy is important. That is really the great strength of globalization …tending to force change on the part of the countries that have higher tax and also regulatory and other policies than some of the more innovative countries. …The way to get revenue is doing all you can to encourage growth and wealth creation and then that gives you more income to tax at the lower rate down the road. In other words, it’s not just me making these arguments. But I’m probably the only person mentioned in this post who almost got tossed into a Mexican jail for having these views. But that’s the risk one takes when fighting evil. The next time I read a blog, I hope that it won’t fail me just as much as this particular one. After all, I know it was my choice to read, nonetheless I really believed you would have something interesting to talk about. All I hear is a bunch of whining about something that you could possibly fix if you weren’t too busy searching for attention. I predict we’ll see this on a small scale in Chicago with the current teacher’s strike. Chicago is already hopelessly in debt. If the teacher’s union gets anywhere near the raises and increase in benefits they are demanding the local government will have choice but to increase the already high taxes in Chicago. I’m certain that thousands of people that have entertained the idea of fleeing Chicago will take this as a green light to make a run for the border. I lived for 8 years just outside of Chicago. The suburbs there are real nice. The taxes are high there too, but the schools are great. The governments of some of these suburban cities really should send a thank you note to the teacher’s union for sending wealthy taxpayers their way. I think much of this is missing the forest for the trees. Tribal America and Africa had many centers of authority, yet had never advanced in knowledge and prosperity. What happened in Europe was the spread of literacy and knowledge. Literacy spread as a direct result of the Protestant Reformation. Terrific post Dan! Jurisdictional competition is a concept I’ve been thinking about more and more. It would be nice to see a society arise where the institution of polycentric jurisdiction was a principal building block. The medieval Europeans managed to fall upon it by accident and the American founders had the idea in mind when they designed a federalist system of governments. But I would like to see an even more radical system where any citizen can leave one jurisdiction and enter another without leaving his or her home. We’re so used to thinking about geographical monopoly jurisdiction that that sentence seems a contradiction, but it’s not. If we lower the cost of switching jurisdiction by severing its link with geography and if we allow new providers to enter the market, then we could see the benefits of jurisdictional competition really grow. I’m really looking forward to reading Professor Vaubel’s paper on this. Another paper which really influenced the way I think about competitive jurisdictions is by Tom W. Bell. This is also a major topic in David Friedman’s work, see this video, and in his book, The Machinery of Freedom. The oldest explication of this concept was by Gustav de Molinari. There is also some recent news worth noting, the inception of the first private city. I’m really looking forward to reading Professor Vaubel’s paper on this. Another paper which really influenced the way I think about competitive jurisdictions is by Tom W. Bell . This is also a major topic in David Friedman’s work, see this video , and in his book, The Machinery of Freedom . The oldest explication of this concept was by Gustav de Molinari There is also some recent news worth noting, the inception of the first private city . So now good luck trying to convince Europeans that unification is detrimental at it’s core. With the desperation of decline already underway, it is too late. Redoubling in the comforting ideas of solidarity (i.e. mandatory collectivism) will continue to be the dominant creed and policy bringing further decline, until the EU disintegrates as an early twenty first century Soviet Union, another great proponent of mandatory collectivism. While democratic mandatory collectivism may be an improvement over authoritarian mandatory collectivism, they both suffer from the same core fundamental path to extinction: the sniffing out of independence and motivation out of the most productive members of society, who, by being exceptional are a minority, almost by definition. But to pick on the theme of America being the beacon of freedom, one must point out notable modern exceptions that are harbingers of decline. “the asylum of freedom” as noted in the text, the country that welcomes the oppressed, in a great exception to its founding principles, turns nasty and vindictive should you ever decide to leave her. In a mimicking of totalitarian regimes that no longer exist, the asylum of freedom will levy heavy emigration taxes should you ever try to leave her and will punish your entire family and relatives by forcing you to give up your citizenship and thus by being unable to come back and see your ailing parents except only on a limited basis, as a tourist. All for the crime of not wanting to pay taxes to the distant and economically irrelevant homeland . All this with the apparent blessing of a majority of Americans, the most freedom loving people in the world. How does this reconcile? I am willing to bet in a time capsule that this issue will figure big in the declining days of the once beacon of freedom and will be a major factor in bringing a turbulent and quicker end to American prosperity, rather than a slow orderly decline And those declining days are coming sooner than you think. As a matter of fact, the process of decline is well under way and has become irreversible. Now the only hope is to hunker down, redouble on HopNChange and now truly hope it does work. Alas naive Americans, if it were that easy to find such shortcuts to prosperity, others would have found them long ago. As Americans you had the luck to be born in a country with the serendipity of being a brand new, almost virgin continent that happened to be seeded by a fringe English freedom loving minority of ideologues who had no chance to advance their ideas to majoritarian status in their home land. A serendipitous aberration of history that at least temporarily reversed the evolutionally out of date human tendency towards mandatory collectivism. Well, you were born in this incredible luck and you blew it! Now France and Argentina are your destiny. If you are foolish enough, you’ll hang around until it happens. America or no America, the evolution and natural selection of cultural frameworks based on efficiency, and thus higher and higher value work, will continue. It will be indeed tragic if democracies end up as self destructing pitchfork rule where a mediocre majority enslaves and snuffs out the life of its most productive members, and thus, inevitably, fall behind in this cultural framework competition. I am optimistic, for democracy’s sake, that some cultures will evolve towards democracy with strong individual rights. We thank America for her contribution to this cultural evolution cause, but I think it’s time to abandon the sinking ship. It’s trajectory is now clear. Let America teach the world another lesson now: How abandoning individual freedom for mandatory democratic collectivism (i.e. degeneration into pitchfork democracy) brings decline in one generation. As I have said many times in the past, the pace of human activities is now accelerating fast. We live in a fast world. Changes that used to take centuries now complete in one generation. The three billion newly (albeit still partially) liberated people of the emerging world have neither the desire nor the patience to see how the wester world’s experiment with mandatory collectivism and flattening of the effort-reward curves turns out. They will take no prisoners. We are fast moving towards the middle chapters of the gospel of mandatory collectivism. The glitzy cover page and foreword, promising HopNChange and an easier path to prosperity by copying the rest of the world, were as intoxicating to Americans as they have been to the rest of the world The scary parts , convergence to average worldwide prosperity levels, are coming. And we get to watch this play itself out in real time in the WSJ Belgium’s New Billionaire. The truth is still the truth; people want to keep the fruits of their labor and do not want to offer it up to the grubby paws of the “retributive” state. Shocker that. From your first Vaubel quote a key question in our globalized world is what form the international competitive order needed should take.